I am not a crazy cat woman. Just to clarify. I love animals. I love my animal companions. I talk to them. They understand. Nothing weird or crazy about it. We hope to have dogs some day, but right now they are too big for our small living quarters and, also, they don’t live as long as cats and somehow I feel like I would be even more traumatized after an animal companion died after 10 years rather than 15 or 18. Someday we hope to rescue pigs (who we will name Fluffy and Dawn), chickens (Henrietta and Roger), and maybe some other former farmed animals who need a home after a rescue. It is amazing how cuddly and sweet animals that we don’t usually think of as pets are/can be when they are loved and treated well. If you are interested, you can visit The Farm Sanctuary (that was their home page) and you can see some cute pictures of some of the animals here. They tell beautiful stories of rescued animals. Because I need to continue to prepare for the service on Sunday and write a case study for a class, today is time to meet Elizabeth and W.’s cat family. Enjoy. Try not to suffer from a cuteness overload. I know they are soooo adorable and sweet. And honestly, there are just so loving and therapeutic. Okay. I’ll stop and move on to the goods. To the left is Leo sleeping between his sisters Annie and Grace. 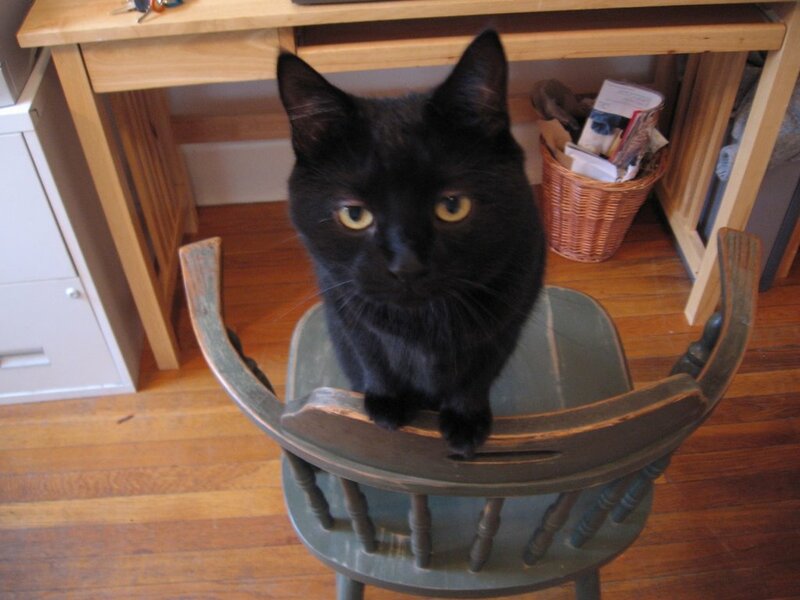 Grace is black and was found in a mud puddle in Middletown, Ohio when I was an undergraduate. Annie is black and white and I adopted her from a shelter in Cincinnati. Leo is in the middle and was found in a forest in Brownfield, Maine and his mother was found nearby — mauled by a coyote. He was transferred to a cat-woman sort of person in New Hampshire, where we adopted him from. He is very shy and our vet said he was probably traumatized by his mom being eaten. Poor thing. 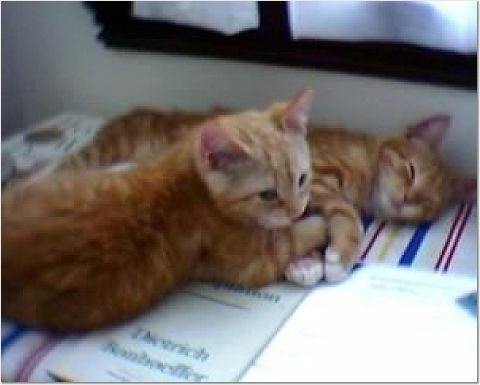 To the right is a picture of Alex and Zach, our two favorite foster kittens who now live with a nice couple in Atlanta. 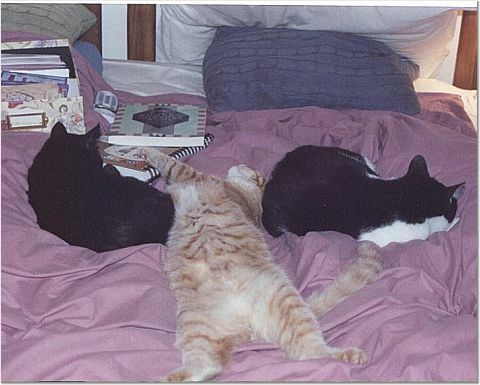 They were adopted and lived in Cambridge for a year, but then relocated when their human-parents moved. I wanted to include more pictures but because I have (thank goodness!) a new computer to replace my dying old one, I don’t have all my pictures on here. So you’re just going to have to wait. I know, it will be tough. Tomorrow it is supposed to be up to 70! Spring is so much nicer than winter. This entry was posted on Thursday, April 20th, 2006 at 2:44 am and is filed under cats. You can follow any responses to this entry through the RSS 2.0 feed. You can leave a response, or trackback from your own site.